Take a look at Iran’s place on the map and it’s easy to understand why the scope of native foods is so wide. Once the centre of the Persian Empire, Iran neighbours the former Soviet Union countries, as well as Afghanistan, Pakistan, the Arab states and Turkey. Although Iran is part of the Middle East, it has close ties to Europe, the Far East and Africa, owing to its central place on the Silk Road trade route. This stew has the shimmering red-gold colour of tomatoes cooked with turmeric, with a sheen of oil on top, a prized characteristic in Persian cooking that shows a stew has been cooked long enough for the oils to rise up. Slightly tart, with the tang of tomatoes, lemon juice, and sometimes the juice of unripe grapes, its tanginess is kept in check by the eggplant, which is first fried on its own until golden-brown, then cooked with onions, lamb and the tomatoes and seasoning. 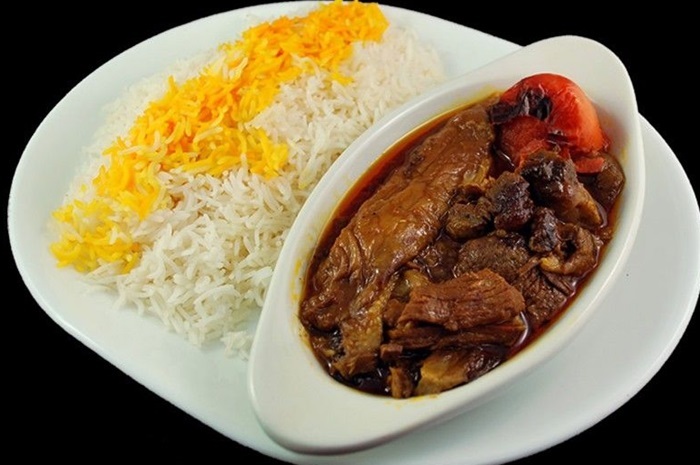 Like all Persian stews, bademjan is thick and meant to be eaten over rice with a fork. 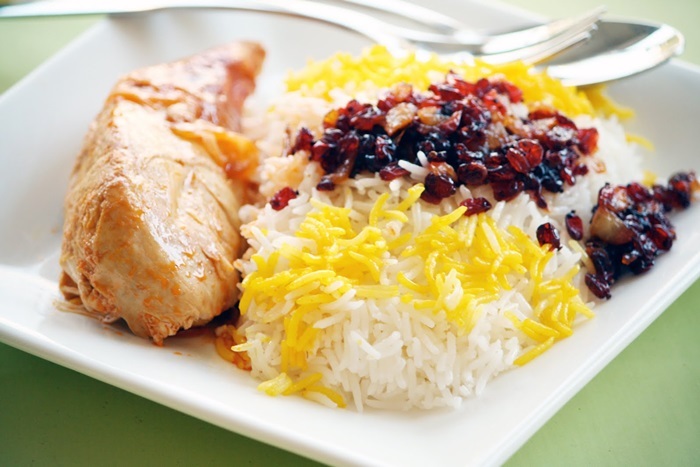 In Iranian cooking, rice can be prepared simply with butter and saffron, known as chelo. But just as often, it’s cooked with other ingredients and called polo. Polo can be made with herbs, vegetables, beans, nuts, dried fruit, meat and even noodles, and acts as the centrepiece of the meal. This polo is particularly good in the spring, when fava beans are young and tender and dill is in season. The dish is flecked with green dill and favas, and is often cooked with very tender chunks of lamb. Alternately, it may be served alongside lamb on the bone. 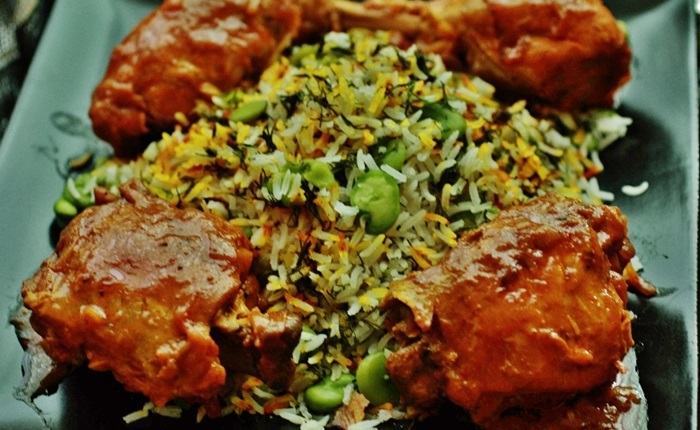 The rice should have a mild saffron flavour, with the saffron mixed into the rice just before serving. Iranians love sour flavours. Like cranberries, barberries have a vibrant red color, but they’re even sourer. This classic rice dish is studded with the red berries, which are dried and then rehydrated before cooking. The rice is cooked with plenty of butter, which helps to soften the intensity of the berries. Quince, rhubarb, green plums, sour oranges, lemons, limes, dried limes, sour cherries, tamarind, sumac and pomegranate are all used in Persian cooking to make food tarter. Made from herbs, kidney beans and lamb, deep green ghormeh sabzi satisfies two Persian flavour obsessions: it’s sour and full of herbs. 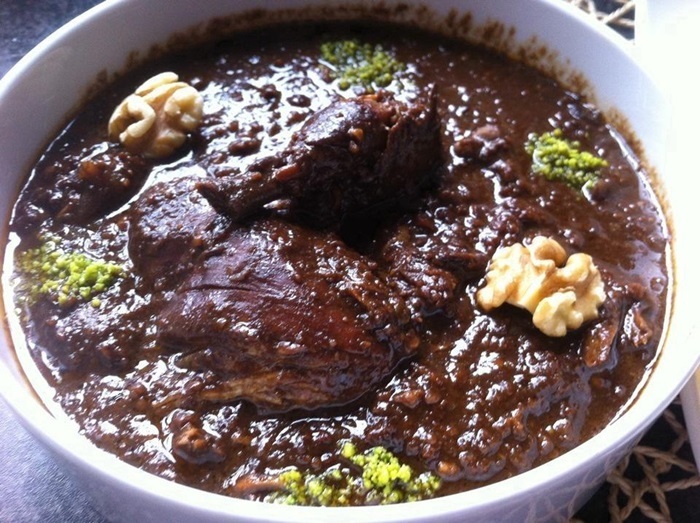 The stew is seasoned with dried limes, limoo Amani in Farsi. These limes are extra intense and sour, with a bittersweet taste that gives the stew a unique flavour. 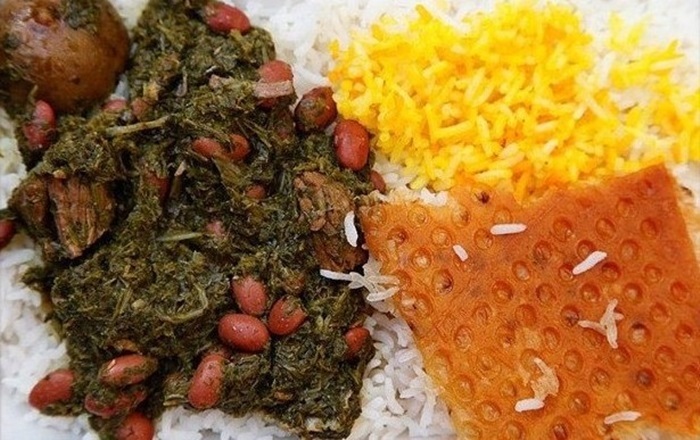 The other constant in ghormeh sabzi is fenugreek leaves, a taste unfamiliar to most westerners. Other herbs include parsley, coriander and scallions. A richly textured soup full of noodles, beans, herbs and leafy greens like spinach and beet leaves. It’s topped with mint oil, crunchy fried onions and sour kashk, a fermented whey product eaten in the Middle East that tastes akin to sour yogurt. 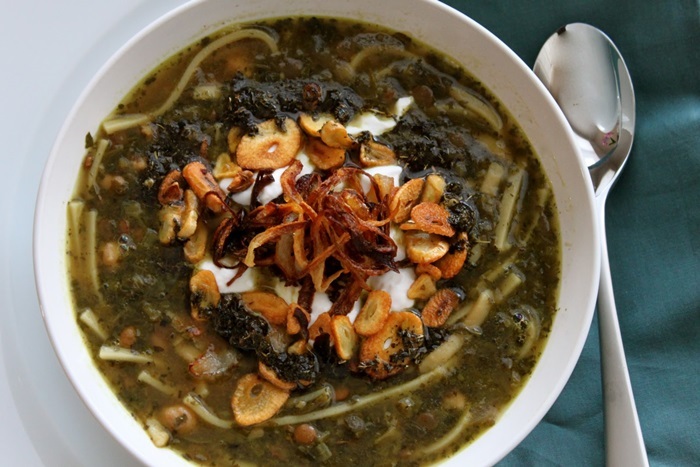 The noodles, which made their way to Iran from China, are thought to represent the many paths of life, and this soup is traditionally served when someone sets off on a long journey. Because of its auspicious ingredients, it’s also part of the menu for Nowruz, the Persian New Year, which occurs at the spring equinox in March. 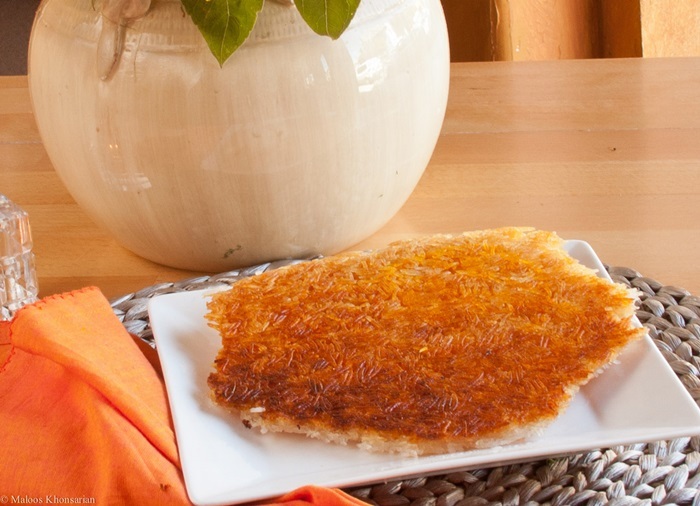 Tahdig is the soul food of Persian cooking. It’s the crisp, golden layer of fried rice at the bottom of the rice pot, and it tastes like a combination of popcorn and potato chips, but with the delicate flavour of basmati ice. (Tahdig is usually not printed on the menu, so you may have to ask for it.) At Iranian family gatherings, there are always plenty of leftovers, but the one dish that disappears completely is tahdig. It’s eaten as a side dish, and it’s forgivable to pick it up and eat it with your fingers. 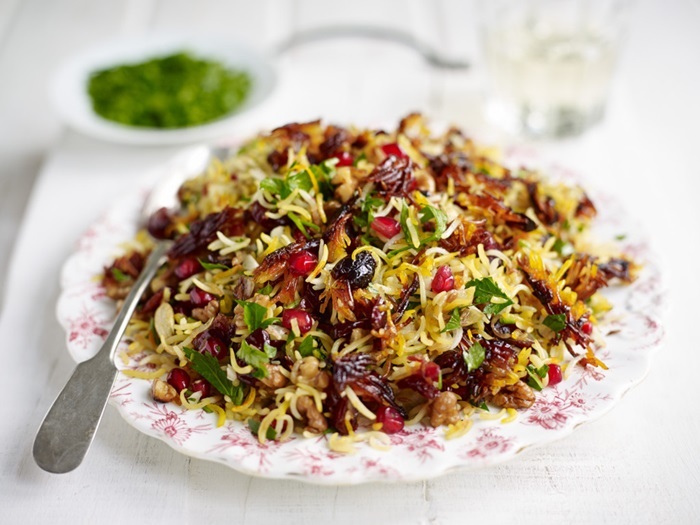 Dotted with brightly coloured dried fruit and nuts, like little jewels, this is a sweet-and-savoury dish that shows off some of the native ingredients of Iran, including pistachios, almonds, candied orange peel, barberries, carrots and saffron. It’s cooked with a little sugar to balance the sourness of the barberries. Jewelled rice is served for special occasions, particularly at weddings, because the sweet elements symbolize a sweet life. It’s traditionally served with chicken, which contrasts nicely with the sweetness. Kebabs have more variety than you might think. First, there’s koobideh, ground meat seasoned with minced onion, salt and pepper. It sounds simple, but the taste is sublime. There is kebab-e barg, thinly sliced lamb or beef, flavoured with lemon juice and onion and basted with saffron and butter. Chicken kebab, known as joojeh, is traditionally made from a whole chicken, bones and all, for more flavour (although in American restaurants it’s often made from skinless chicken breast), marinated in lemon and onion, and basted with saffron and butter. 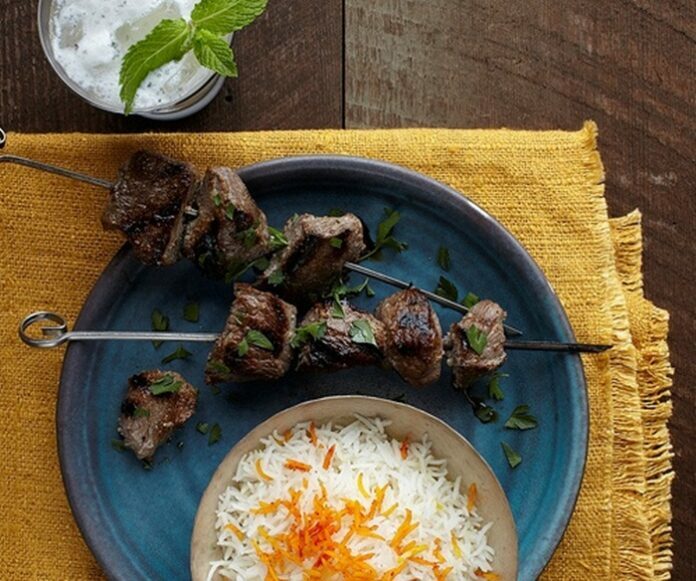 If you’re lucky, you’ll find jegar, lamb liver kebab, garnished with fresh basil leaves and a wedge of lemon. 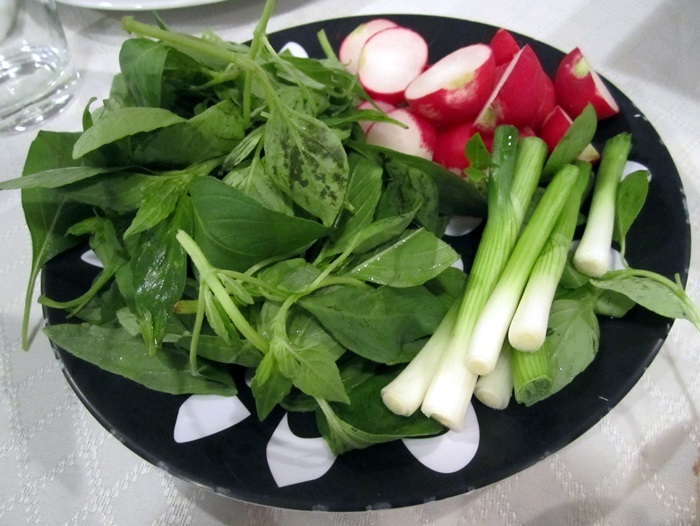 No Persian meal is complete without a dish of sabzi khordan, or edible herbs. The plate can include mint, tarragon, basil and cilantro, alongside scallions, radishes, walnuts, feta cheese and Iranian nan (flatbread). Simply tear off a piece of flatbread, tuck a bit of the herbs and cheese and other garnishes inside, and fold it up like a rustic sandwich. The plate stays on the table throughout the meal, and the herbs are a crunchy palate cleanser between bites of stew and rice. Fresh and dried green herbs are eaten daily in Iran. The Zoroastrian New Year Nowruz celebrates rebirth and renewal, and the Nowruz menu includes several dishes made with green herbs representing new life, including rice with herbs, an herb omelette and the herb platter.